Emelia Voile Sheers. This is a 40" window with 2 panels of 60X84 sheers tied back over 2 more sheers of the same size. The Emelia Voile Sheers are 100% polyester. The 60 X 84 panels feature 5" bottom hems with a 1 1/2" rod pocket and 1 1/2" heading. Available in white or ecru. Emelia sheers are available also in swags, valances, scarves and tiers. Available in colors white or ecru. Imported. For best results, use sheers to a fullness of at least 3 times your window width. Example: For a 40" window use at least 2 - 60" width sheer panels. 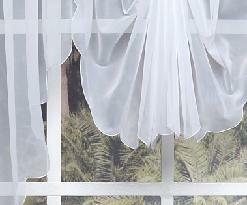 Emelia Voile Sheer swags and valances feature scallop edge. Tiers have a tailored hem at the bottom. They are a beautiful sheer that can be used anywhere from the kitchen, bedroom or bathroom. To create the look as in the picture you will need to use the filler valance in the middle of the swags. Tiers and swags are sold in pairs. Machine washable and tumble dry on low heat. Available in colors white or ecru. 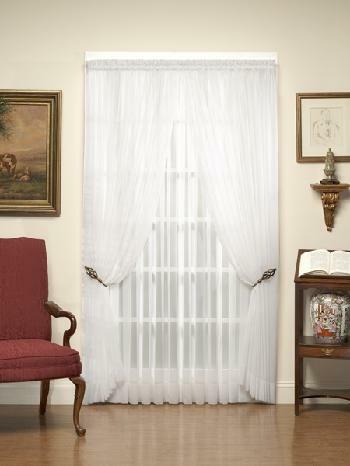 Pictured above: 1 - 60 X 38 Emelia Swag Pair with 1 - 60 X 14 filler valance and 2 pair of 60 X 24" tiers on a 50" window. 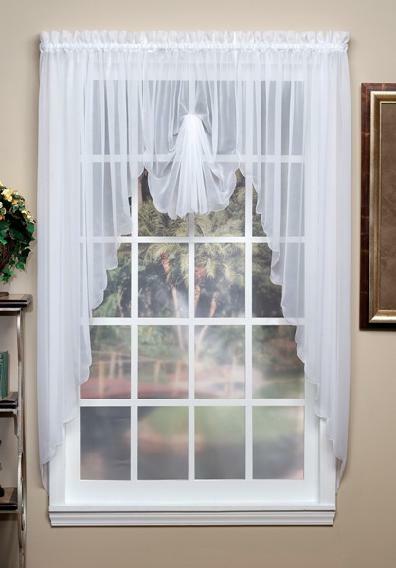 Pictured above: 1 - 90 X 63 Emelia Swag pair with 1 - Fan Insert valance on a 36" window. Emelia Voile Sheer swags are the perfect match for those windows where you do not wish to cover alot of window. 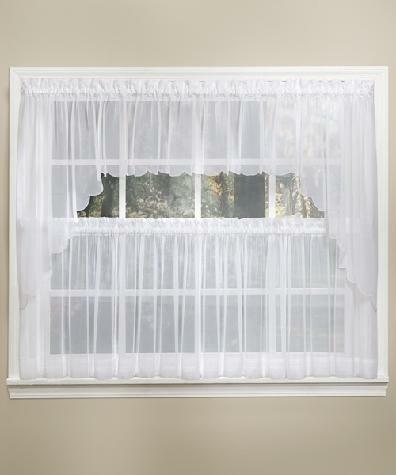 Use the fan insert valance or the regular insert valance and add as many as needed to fit your window. Along with the swag, use one valance for every 20" of your window width. Example: If your window is 60" wide you would need the swag pair along with 3 filler valances. Available colors are white or ecru. 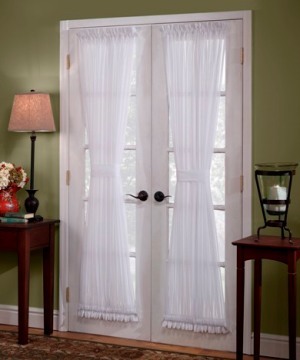 Emelia Sheer Voile Door Panels are 41" wide and each door panel comes with one tieback. For the best results we suggest that you use 2 of the 41" wide panels for each door. These door panels are made 41" wide so they can also be used on sidelight windows which are very narrow. Sidelights windows are the small narrow windows that are at the sides of the door. The most common size for patio doors is the 72" length. With door panels you may have to mount a couple inches above and below the glass to get the correct fit. Door panels need to be installed taut with no slack in the fabric. Available in colors white or ecru. Emelia Sheer Door Panels. To get your door to look this good you will need to use 2 - 41" wide door panels for each door. This will give you even more privacy on a door that you do not tieback. Each door panel comes with one tieback.